The modern British beer revolution of the past decade began within the cities. Railway arches, disused shipping containers and industrial estate warehouses have served as birthing grounds, for what are now considered to be some of the country’s best and most progressive breweries. It wasn’t the breweries alone that sparked this modern brewing boom, however. 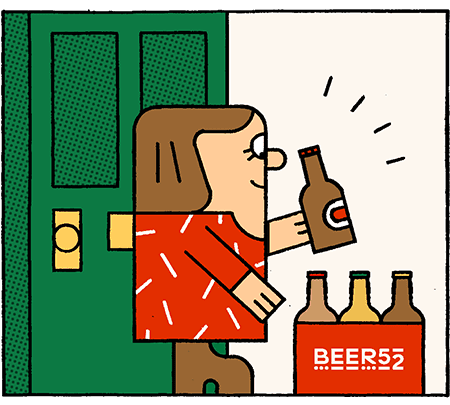 The more breweries that appeared, the more fertile the areas surrounding them would become, allowing a new wave of pubs, bars and bottle shops to burst through the concrete—just as the breweries that came before them had done. It happened in London’s South and East, in Hackney, Bethnal Green and Bermondsey. It happened in Manchester’s vibrant Northern Quarter and surrounding areas. The city centre of Leeds became an intensely enjoyable location for a beer lover to spend time. And other cities followed suit: Bristol, Liverpool, Newcastle, Edinburgh, Cardiff and Belfast, to name just a handful. Whatever you choose to call it, modern beer owes a great debt to the cities that gave it such a strong start. However, urban life is not the be-all and end-all of existence, and the same is true when it comes to beer. As the cities slowly become saturated with more and more breweries and bars, so the people behind these businesses begin to contemplate a different kind of existence: a quieter, more peaceful, rural experience. It’s a life not without its challenges, but for brewers these challenges look very different to those found within a city. While the financial outlay might be lower in the countryside, the lack of a large population surrounding your business requires the establishment of strong ties to locals, sometimes even listening to their needs ahead of your own. These challenges aren’t stopping a new wave of brewers from heading to these mellower, greener pastures and carving out a slice of the countryside for themselves. This is how British craft beer began its escape to the country. As with most modern breweries, Miranda Hudson and Derek Bates, co-founders of Norfolk’s forthcoming Duration Brewery, got their start in a city. Brixton, in South London, is where this couple built their home and started a family, while Bates cut his teeth in the brewing world as head brewer for Bermondsey’s Brew by Numbers. In addition to this, many of Duration’s early collaborations have been with members of the South London brewing fraternity, such as Gipsy Hill or Brixton Brewery. It would have made a lot of sense to start their brewery here. But this wasn’t to be. Instead, Miranda and Derek were lured by the East Anglian countryside, finding a disused Grade II listed farmhouse adjacent to the site of a 12th century priory, nestled alongside the banks of the River Nar. In October 2017, Duration was given permission to renovate the farmhouse and build the destination brewery the pair had dreamed of. And in summer 2018, Duration will find out if the decision to set itself up in the countryside will be worthwhile, when it finally opens its doors to the public. As beautiful and inspiring as the Norfolk countryside may be, it’s also home to a significantly smaller and older population than Miranda’s former London home. Duration may not want to be moulded by any existing scene, but with the absence of one (or at least the existence of one that is much smaller and quite different to an urban locale) they will instead have to work hard at creating it themselves. Duration is just one example among many of a modern brewery trying to make a go of it in the East Anglian countryside. Just a few miles away in the Suffolk village of Edwardstone is Little Earth Project, where brewer Tom Norton is creating some spellbinding beers, relying heavily on barrel ageing and wild fermentation. The lure of a rural environment doesn’t appeal to brewers alone, but attracts folks from all parts of the beer industry. This should make a lot of sense, because the life cycle of all beer starts in the countryside: in fields of barley and within the twisted bines of hop trellises. Formerly a brewer at both Brodie’s and Weird Beard in London, Jonny Bright and his partner Amélie Varon moved to the town of Hereford—perhaps better known for its cider than its beer—and established the Hereford Beer House in 2015. Jonny admits things were challenging in the early months of trading, as the people of Hereford weren’t actively seeking the latest hazy IPA releases from the likes of Cloudwater and Verdant in the shops. But by establishing a modern attitude without any stigma or pretension, the locals soon warmed to what Jonny and Amélie were attempting to do, and these days they sell plenty of hazy IPA—alongside lots of great cider and more traditional beer styles of course. Where once modern beer was a pursuit confined to the cities, now it’s something that, slowly but surely, is becoming within reach in almost all parts of the UK. We’ve still a way to go before the experience is as all-encompassing as it has become within urban environments, but with the likes of Little Earth Project, Duration and The Hereford Beer House – to name just a handful of examples – that change is being affected both positively and with increasing velocity.